The Naspers Board announced their intention to implement an Unbundling by way of a pro rata distribution in specie of ordinary shares of no par value in Multichoice for no consideration to Shareholders in terms of section 46 of the Companies Act and section 46 of the Income Tax Act. 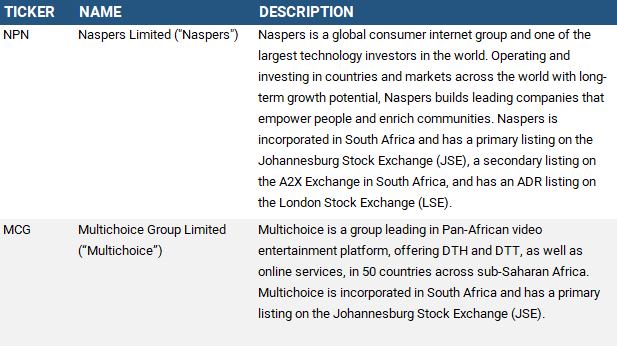 Shareholders are to receive one Multichoice Share for every one Naspers "N" Share held. Multichoice was also simultaneously listed on the main board of the securities exchange operated by the JSE Limited as a primary listing. Pursuant to the Unbundling, Multichoice will be an independent publicly traded company. Shareholders are to receive one Share for every one Naspers "N" Share held and one Share for every five Naspers "A" Shares held. Both companies are listed companies as defined in section 1 of the Income Tax Act. Section 46(1)(a)(i) of the Income Tax Act requires that equity shares of a resident company are distributed by a resident company to the shareholders of that company. Naspers and Multichoice are both resident companies as defined in section 1 of the Income Tax Act. Both companies form part of the same group of companies. As per section 46(3)(a)(bb) shareholders holding ordinary shares as capital assets will be deemed to acquire the unbundled ordinary shares as capital assets. The original expenditure (base cost) incurred in respect of the ordinary shares, in terms of paragraph 20 of the Eighth Schedule to the Income Tax Act, and (where applicable) the CGT valuation of the ordinary shares, as contemplated in paragraph 29 of the Eighth Schedule to the Income Tax Act, will be apportioned between the NPN ordinary shares and the MCG ordinary shares by applying the ratio that the market value of MCG ordinary shares bears to the sum of the market values of the NPN ordinary shares and MCG ordinary shares at the end of 27/02/2019 (LDT + 1). Pursuant to the Binding Class Ruling obtained, Shareholders are hereby advised that the expenditure and market value, as the case may be, of their MCG shares as referred to above must be apportioned in the ratio of 96.6% to an NPN share held after the Unbundling and 3.4% to an unbundled MCG share ("Apportionment Ratios"). The Apportionment Ratios are based on the closing price of R3017 per NPN share and R106.10 per MCG share on 27/02/2019 being the Unbundling date. R106.10 / R3123.10 = 3.3973%. Note: Per SARS Binding General Ruling (Income Tax) NO. 29: Unbundling Transactions: Meaning of “As at the End of the Day after That Distribution”, we should be using the market prices on the date after the distribution i.e. LDT+1. “The Unbundling” part of the event will have no CGT gain for NPN shareholders, as per relief provisions under section 46 are applicable. This document must not be considered to be tax advice. This document is confidential and is only authorised to be distributed to DMA employees that require this information to perform their employee duties. For the purposes of this document, it is assumed that all investments are held on capital account.